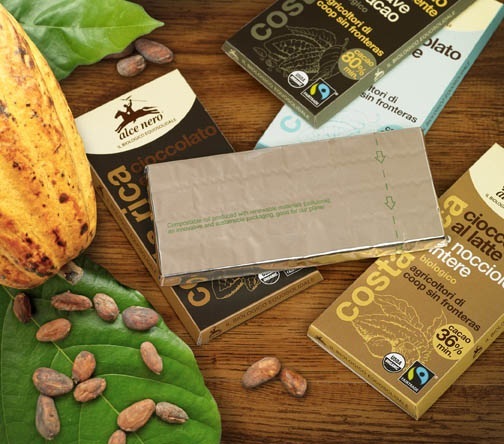 An Italian consortium, of organic producers and farmers, has chosen compostable NatureFlex™ from Innovia Films to wrap its range of Fair Trade chocolate. Alce Nero, part of Alce Nero Mielizia SpA, and its members share a common ethos for regionality, innovation and the environment. The choice to farm organically has characterised the organisation since its inception in 1978. Today the company represents farmers, beekeepers and Fair Trade producers, all members of the company. Real organic food from around the world, not just Italy, is promoted by Alce Nero. “We decided to move from standard plastic to a biodegradable and compostable alternative to wrap our chocolate bars. Metallised NatureFlex™ from Innovia Films was a perfect fit for us due not only to its environmental attributes but also its excellent barrier properties to keep our organic Fair Trade chocolate in premium condition,” explained Nicoletta Maffini, Marketing Manager, Alce Nero. The consortium’s chocolate bars are made with cocoa from plants grown in Costa Rica, in the heart of Central America, by the partner COOP Sin Fronteras, a network of small Fair Trade producers. The cocoa pods are harvested, the beans are roasted and the exceptional skill of a long established Swiss maison chocolatier, Chocolate Stella of Chocolate Bernrain Group, subsequently transforms them into delicious products. NatureFlex™ films are certified to meet the American ASTM D6400, European EN13432 and Australian AS4736 standards for compostable packaging. The wood-pulp is sourced from managed plantations. The renewable biobased content of NatureFlex™ films is typically 95% by weight of material according to ASTM D6866. Offering advantages for packing and converting, NatureFlex™ films have inherent deadfold and anti-static properties, high gloss and resistance to grease and oil, good barrier to gases, aromas and mineral oils and a wide heat-seal range. NatureFlex™ was an obvious solution for use in this application as the film begins life as a natural product – wood – and breaks down at the end of its lifecycle in a home compost bin (or industrial compost environment) within a matter of weeks. It is also confirmed as suitable for emerging ‘waste to energy’ techniques such as anaerobic digestion. “Our metallised NatureFlex™ film is used to good effect here by Alce Nero as it fits in with their brand image, protects the product and is compostable,” said Giorgio Berton, TS&D Specialist, Innovia Films.